Originally, there were many different traditional Native American clothing styles in North America. Nearly every tribe had its own distinctive style of dress, and the people could often tell each other's identities by looking at their tribal clothes, headdresses, and ornamentation. In most tribes, Native American men wore breechclouts or breechcloths (a long rectangular piece of hide or cloth tucked over a belt, so that the flaps fell down in front and behind), sometimes with leather leggings attached in colder climates. Here's a page of breechcloth and legging pictures. In some tribes Indian clothing for men was a short kilt or fur trousers instead of a breechcloth. Most American Indian men did not use shirts, but Plains Indian warriors did wear special buckskin war shirts decorated with ermine tails, hair, and intricate quillwork and beadwork. Here are pictures of two traditional Sioux war shirts. Native American clothing for women usually consisted of skirts and leggings, though the length, design, and material of the skirts varied from tribe to tribe. In some cultures, Indian women's shirts were optional and were treated more like coats. In others, Native American women always wore tunics or mantles in public. And in some tribes women usually wore one-piece American Indian dresses instead, like this Cheyenne buckskin dress. Nearly all Native Americans had some form of moccasin (a sturdy leather shoe) or mukluk (heavier boot), with the styles of footwear differing from tribe to tribe (as you can see from these mocasin pictures). Most tribes used cloaks in colder weather, but some of the northern tribes wore Inuit-style fur parkas instead. Most variable of all were headgear and formal clothing, which were different in nearly every tribe. Here's a page illustrating traditional hairstyles from several different tribes. After colonization, the clothes of Native Americans began to change. For one thing, as Indian tribes were driven from their ancient lands and forced into closer contact with each other, they began to borrow some of each other's tribal dress, so that fringed buckskin clothing, feather headdresses, and woven blankets became popular among Indians outside of the tribes in which they originated. For another, Indians began to adapt some articles of European costume to their own style, decorating cloth garments with characteristic Native American beadwork, embroidery, and designs. These clothes were not original to the Americas, but by the 1800's they were recognized by anyone viewing them as American Indian apparel. Such post-colonial native dress includes beaded jackets and shirts, ribbon shirts, Seminole patchwork skirts, satin shawls, woolen sweaters, broad ribbon applique, jingle dresses, and the Cherokee tear dress. Today, most Native Americans wear contemporary American and Canadian clothes in their daily life; however, unique American Indian clothing styles still exist. Some traditional American Indian garments, such as buckskins, ribbon dresses, and beaded moccasins, are still worn in many tribes, particularly to formal events. 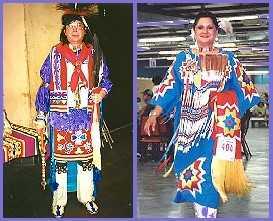 Others, such as breechcloth, leggings, headdress and dance shawl, are only worn at powwows and religious ceremonies. In general, American Indians use the word regalia for traditional clothes which are used for ceremonial occasions. Some native people find the phrase "Native American costume" offensive, due to long association with hurtful red-faced Halloween costumes. If you are looking to buy native regalia or other clothes that were actually made by Native Americans--either because it's important to you to have the real thing or because you want to support native people with your purchase--then here is our list of American Indian clothing designers whose garments are for sale online. We have grouped them into Traditional Native American Clothing (both ordinary Indian clothes and ceremonial regalia), Contemporary Native American Clothing (modern clothes like tee-shirts made with native designs), and Native American Designer Clothes (contemporary Indian clothing styles designed as wearable art and priced accordingly). If you have a website of Native American clothes to add to this list, let us know. We gladly advertise any individual native artist or native-owned clothing store here free of charge, provided that all clothes were made by tribally recognized American Indian, Inuit, or First Nations artists. Thank you for your interest in Native American clothing! On our main site we do our best to avoid slowing down our page loading with graphics, but this page is about art, so we'd really be remiss in not showing a few representative Native American clothing pictures. All photos are the property of their respective artists; please visit their clothing websites to see their artwork in more depth. Since all of these traditional Native American clothes are handmade and many are custom-made, they don't usually have a large inventory of identical items. So if you love an artist's work but they don't seem to have the right size, color, or style currently for sale, I recommend you contact them. Many of these artists will make native clothes to your specifications, and others have a much larger selection of clothing in their store than they have featured for sale on their website. This Otoe family specializes in making Oklahoma style pow wow regalia, but they also carry a wide variety of other traditional American Indian clothing and dance apparel--check out the Photo Album for more clothing styles. Jingle dresses, fancy shawls, and other powwow wear handmade by a Tohono O'odham artist. Her Native American children's clothes are just adorable. Traditional Indian dresses and beaded regalia by an award-winning Navajo artist. If the native dresses are our of your price range, check the beaded shirts and purses in the online store. Native American roaches (men's dance headdresses) handmade by a Poarch Creek lady. A roach headdress is made of colored deer fur and porcupine guard hair, not the sharp quills. Another good source for quality handmade roaches, by a Potawatomi artist. Native American dance shawls by Lakota Sioux clothing artist Gerald Wright. Beautiful hand fringing. If you're looking for a Plains Indian breastplate, these Blackfeet artists make really beautiful ones. The rods are traditionally made of bone hairpipe or buffalo horn. American Indian breastplates were originally worn by Plains warriors as armor, but today Native men only wear them ceremonially, as regalia. This Mohawk designer makes traditional Native American ribbon shirts and dresses, buckskin shirts, and deerskin Native American dresses. Ribbon shirts and dresses, dance regalia, and Native American wedding dresses by a Cayuga seamstress. The Seminole Tribe of Florida is selling beautiful Seminole patchwork skirts, jackets, capes, and shirts, including children's clothing. Traditional finger-woven sashes and fringed buckskin jackets from a Metis artists' cooperative. The most universal element of Native American dress, moccasins were worn throughout North America and into Central America, and remain popular footwear among many Indian tribes today. Visit our Native American Moccasins page to buy some from contemporary Indian artists. This moccasin store also sells traditional fur and leather mittens in the Cree and northern Indian style. This First Nations craft shop sells Native American gloves and mitts in the Ojibway style. Among the Northwest Coast Indians there is a long tradition of weaving wool clothing by hand (originally using mountain goat hair, later sheep's wool). About a century ago Salish Indian weavers turned this skill towards sweater-making, and their distinctive designs have become a native Canadian classic. Hand-knitted Native American sweaters, scarves, and other winter clothes by Coast Salish crafters. This Northwest Indian clothing store sells handmade Cowichan Indian sweaters, mittens, and other woolen clothes. Sometimes, all you're looking for is a Native American t-shirt. Here are some of our favorites. This Navajo-owned clothing store screen-prints t-shirts with designs by contemporary American Indian artists. (The one at left is by Navajo artist Baje Whitethorne.) They have a broad selection of prints and you can get a really striking t-shirt this way. 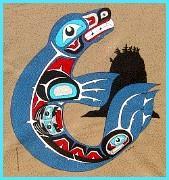 Northwest Indian t-shirt designs by a Nuu-chah-nulth artist. This native-owned store also sells scarves and ties with Indian designs. This Sioux-owned company, ubiquitous at powwows, is selling their t-shirts with humorous American Indian logos online now. This Anishinabe-owned Native American clothing store specializes in T-shirts. They also carry other Chippewa products such as ribbon shirts, quill baskets, and jewelry. These Native American fashion labels are expensive to buy, but all three are Indian-owned, and if you can afford them, the clothes are beautiful enough to be worth their price. Contemporary Canadian fashion designs with an Iroquois flair. Check out the women's capes and hats. Designer Native American clothing in dramatic Northwest Indian designs, by a Haida artist. This Spokane Indian clothing designer presents fine leather jackets painted with Northwest Coast designs. Woven blankets were used as cloaks in the Southwest and dance regalia in the Pacific Northwest; later, colorful wool blankets introduced by Europeans became popular as outerwear in many tribes. 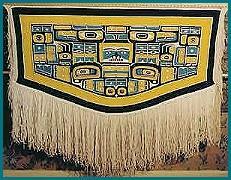 Today, blankets are not usually used as articles of clothing, so we have put our pictures and information about Native American blankets on the page with Indian rugs and other weavings. Look for it there! A good book about native clothing styles and regalia in different Indian tribes. Book describing how to make buckskin clothes and other traditional Indian clothing. 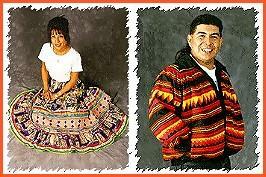 Cultural background and color photographs of traditional Plains Indian clothing. Coffee table book featuring American Indian dresses and dance regalia from many tribes. Photography book about Indian clothing from the past till the present day. Another artistic book about Great Plains Native American clothing. 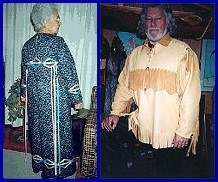 Descriptions and sewing patterns for traditional Cherokee Indian dress and accessories. Good book on Eastern Woodland Native American clothing, with many photographs. Here's a good book about traditional Inuit (Eskimo) clothes, with illustrations. Detailed book about the Indian clothing of Mexico. The Indian Arts and Crafts Act: US law against passing off fake American Indian crafts as genuine. What constitutes Native American art fraud, and how to report it if you find it. First Nations Clothing: Excellent online photographic collection of Inuit and Canadian Indian clothing. Native American Leather and Clothes: Articles, sketches, and photos of American Indian clothing from different regions. Native American Clothing, Regalia and Textiles: Photographs, descriptions, and links about traditional Indian clothes. Clothing of Indians: Anthropology text about Native American Indian clothing in various tribes. Haida Native Clothes: Photo exhibit of Northwest Indian clothing from the Canadian Museum of Civilization. The Mathematics of Seminole Patchwork: Article about the designs, legends, and geometry of Seminole Indian patchwork. Seminole Patchwork: How to make Seminole Indian skirts and other clothing, with illustrations. 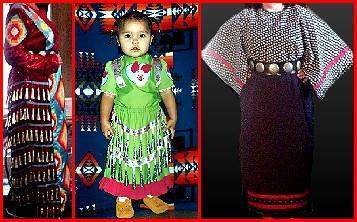 Women's Jingle Dress: The origins and tradition of the jingle dress and jingle dance. Cherokee Tear Dresses: The legend of the Cherokee Tear Dress and how they are made. Cowichan Sweaters: Background and photographs of these Native Canadian knitted sweaters. 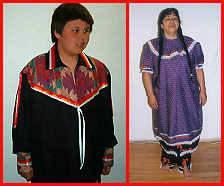 Native American Clothing: Orrin contributed to this larger directory of authentic American Indian clothes. Native American Information: View our fact sheets for individual Indian tribes, with information about traditional clothing styles in each. About us: This website belongs to Native Languages of the Americas, a non-profit organization dedicated to preserving and promoting endangered Native American languages. We are not artists ourselves, so if you are interested in buying some of the Native American Indian clothes featured on this page, please contact the artists directly. Though we have featured only Native Indian clothing and regalia identified with the name and tribal affiliation of each artist, we haven't called the tribal offices to check up on any of them, and we only know a few of them personally. This is not an exhaustive list of American Indian clothing--if you would like us to add your native clothing site to this page, please contact us with your URL and tribal affiliation. We advertise any individual native artist or native-owned art business here free of charge. We do not link to clothing or regalia which is not made by tribally recognized American Indian, Inuit, or First Nations artists. And finally, websites do expire and change hands, so use your common sense and this general rule of thumb: if the creator of each individual outfit is not identified by name and specific tribe, you are probably not looking at authentic American Indian clothes.